In case I haven't mentioned it before, I eat at McDonald's A LOT. I could eat it for breakfast, lunch and dinner. There was a time that I think I may have had a double cheese burger meal (w/ BBQ sauce) and 6 piece Nuggets for dinner for 2 straight weeks. I didn't feel any heart problems or anything like that, but I did gain quite a few pounds hehe. What do I usually eat for breakfast when I'm there? Not the Big Breakfast with the sausage patty, eggs and muffins. Not the longganiza meal either. Or their Pancakes. 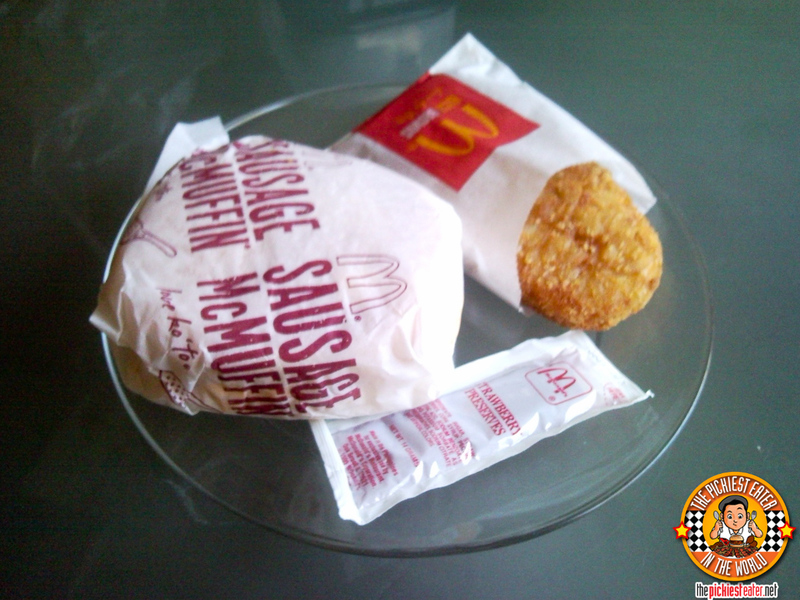 Like i said, I'm a simple eater, so I like their plain Sausage McMuffin (no egg) and Hasbrowns. But of course, being the weirdo that I am, i add a little twist. 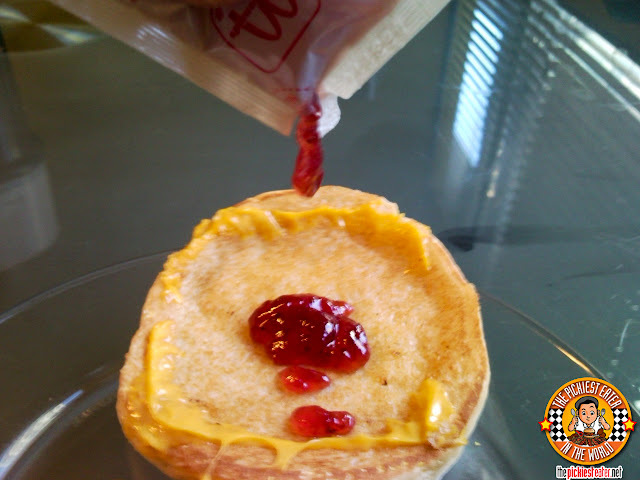 I yank off the top muffin, and pour some strawberry Jam. many people may find this weird.. Jam and sausage, right? Don't knock it till you've actually tried it. I think you'll be pleasantly surprised with the results. Using the same concept of crunchiness in the burger as we did in my first McDonald's post, I snap off half of the Hash Browns and place it on top of the McMuffin. 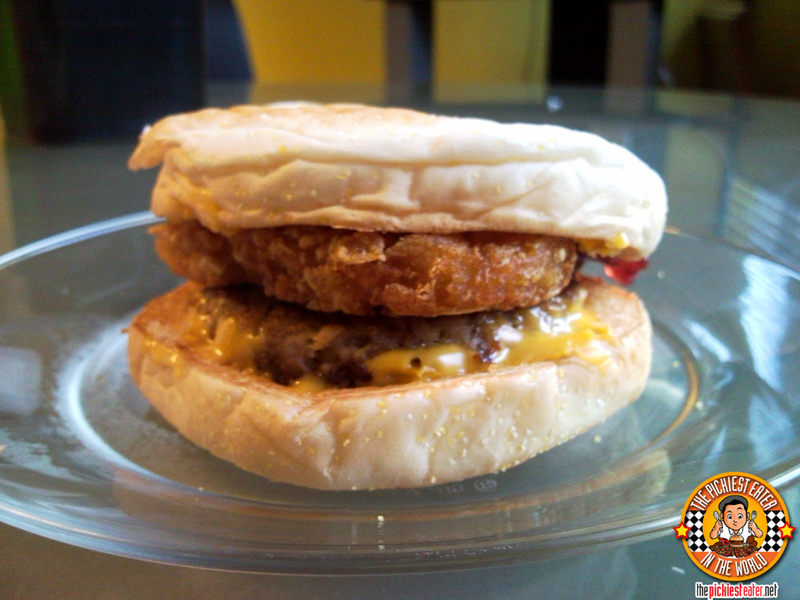 The RichieZ McMuffin (P64) is a great reason to wake up in the morning, because it's not so heavy on the stomach but it's filling just the same. You get the savory goodness of the trademark McDonald's Sausage Patty, with a touch of sweetness to it.. and you get some carbs in your meal as well! Everything your body needs to start the day! About to chow one down in my office table hehe.. I said I was going to eat this one time during a facebook post, calling it my "weird breakfast quirk". Quite a few people responded saying that was rather time when compared to some of the breakfast quirks they do or someone that they know, does. Stuff like Vinegar with Eggs.. that sorta gross things.. that made the RichieZ McMuffin look like a normal ham and eggs meal. What quirky things do you eat? Interesting idea, Richie! 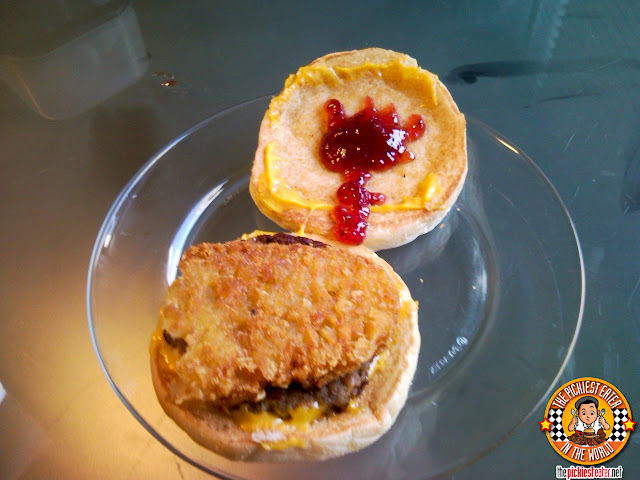 We might just give the RichieZ McMuffin a try sometime. many people i know don't actually eat strawberry jam with peanut butter, but that, i love! your mcmuffin is intereting to try..
oooh I do that too! This reply is quite late, but I want to share my breakfast quirk with you! I pour coffee with milk on a bowl of fried rice and top it off with grated Parmesan Cheese! Divine! Mine is considerably tame compared to yours!! sweet and spicy lucky me pancit canton topped with sunny side up egg and finish with tomato ketchup! Mine's: Batangas Pork Tapa + (Cold Rice + Hot Coffee) = PERFECT Breakfast! first time I heard about cold rice for breakfast Johnston! sounds interesting!